As far as ideas for books go, Daisy Buchanan’s Daughter seems like a very good one—very high concept. Remember The Great Gatsby that they made you read back in high school? Remember F. Scott Fitzgerald, with his crazy wife Zelda ballet dancing in the attic? Remember Gatsby and Daisy: how he looked to the green light at the end of her dock (which juts into the waterway that divides fashionable and exclusive East Egg from the encroaching new wealth of West Egg) and how he yearned for her (with Fitzgerald so perfectly capturing that emotion, his yearning)? And how she maybe she had real feelings for him as well—at least as far as she was capable of real feelings, even though she was married to a loutish polo player named Tom? Remember also that Daisy had a daughter? And remember what she said about her little baby daughter, what she hoped the girl would grow up to be? As Daisy put it: “I hope she’ll be a fool—that’s the best thing a girl can be in this world, a beautiful little fool?” Remember that these were words that Fitzgerald stole from his own wife Zelda, who actually said them when their daughter Scottie was born? Keep in mind that Gatsby is considered by a good many people to be the finest novel of the 20th century—by some perhaps the finest of all time. Keep in mind that Gatsby is a sacred thing, almost as if it had been discovered among the Dead Sea Scrolls. 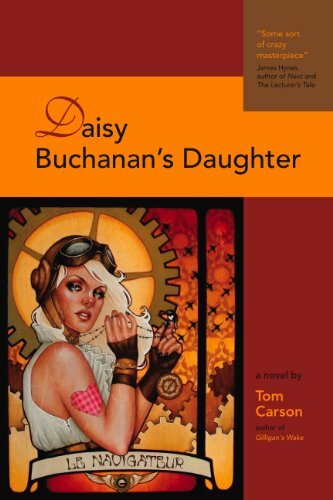 Now imagine that Daisy and Tom Buchanan’s daughter had been named Pam and had grown up to become the writer that her mother had yearned to be but had never become. Imagine further that she, Pam, had had many husbands and many adventures of her own—adventures that very often put her in the center of global events, including World War II. And imagine that, at present day, Pam sits at the keyboard of her Macintosh in her home in Washington, DC, a place she refers to as “Potusville,” where, as she puts it, “I roost on upper Connecticut Avenue like a falcon.” From there, Pam posts to her blog, putting into digital form the bits and pieces of memory that, gathered together, might in a pinch stand in for a proper memoir. Thus we are given the unvarnished remembrances of an 86-year-old political warhorse and society doyenne. And learn of her picaresque journey from Long Island, around the whole of the globe and back again, ending up just a few hundred miles from where she began back in Fitzgerald’s fictional East Egg through 628 pages of “Pam’s Posts” at daisysdaughter.com. It all sounds like such a great idea, doesn’t it? But written by Tom Carson and carrying as pedestrian a title as Daisy Buchanan’s Daughter, the results are, well, something more (think: bloated) and something less (think: narrative thrust) than might have reasonably been hoped for. Author Carson’s Pamela is one of the garrulous types that the reader most fears will trap him in a corner at a cocktail party and enlighten him on the significance of any number of political or religious events. This makes the slog through her first-person account of her life and times something of a slow go. Not that there are not some high spots. The image of President Lyndon Baines Johnson resting his head in Pam’s lap amuses, as does the notion that JFK beats out Pam for the Pulitzer Prize. And those who last until the very end will be given a laugh out loud moment in which a certain obituary appears. “In my younger years, less invulnerable years, I often wished my guardian hadn’t told me what Daisy was alleged by no less an authority than herself to have wished for me at birth. He had so few even fugitively Pamcentric anecdotes in stock that I can’t blame him for sharing that one when I kept whinging, and she didn’t get her stupid wish. Or, depending on how you count, her fairy-tale three wishes. “No, mother: your daughter never did get to be beautiful. Not even stay so little once I shot up to a hoop-hunting five foot ten in the Midwest the year after you died. And I wasn’t a fool. I made my own way. “Early on, I learned or relearned how to be American, a skill you couldn’t have imagined was one. By the age of twenty-one, I was doing something you never did: earn my living. And as a writer, too, just what I once heard you bragging to the Lotus Eater in Provincetown you’d be. In short, the ideas presented in this book are wild and woolly and well worth committing to the page. The concept of taking that most American novel, Gatsby, and extending it across the decades, to allow the American ideal of it—that emblematic green light—to shine upon all that our nation has become and may yet be, is perhaps even brilliant. And the character of Pam as a brittle majesty gives the novel a dynamic it needs. But the execution of the novel itself, the nuts and bolts of it, however, is far less satisfying. Indeed, if a book’s language were décor, this would surely be rococo at it’s most grotesquely torture: all buxom and bloated, frowsy and overblown. And at times the sheer verbiage of the book is so dense that the reader feels as if he needs to carve through it with a machete, like Humphrey Bogart cutting through the hot, damp jungle in The African Queen. As the reader remembers that most perfect of novels, The Great Gatsby weighed in at a slim 180 pages. If only Tom Carson had learned from his betters. Most certainly, no book in recent memory would have benefitted more from a strong edit. Cut in half, the novel might have emerged as an enjoyable read. As is, it is rather like that society lady who has forgotten the basic rule of dress and has not, before going out the door to her evening event, taking a long, hard look at herself in the mirror, assessing herself with brutal honesty and removing at least one accessory before going out the door. A little less here would have added up to so much more.